The Circular Garden installation comprises a chain of 60 four-metre-tall arches, matching a form used often in the work of Catalan architect Antoni Gaudí. End-to-end the chain measures a kilometre – a "record" length for the fungus material. 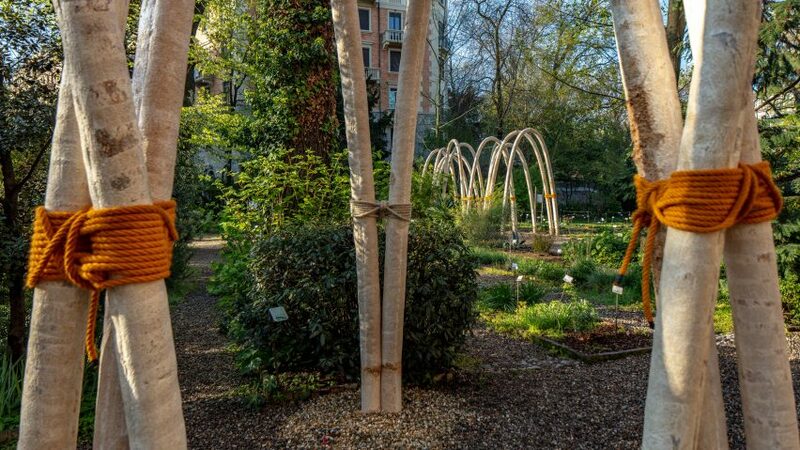 Found dotted around the Orto Botanico di Brera botanical garden in Milan, the archways were grown organically "just like real mushrooms" over a period of six weeks from mycelium – the fibrous root of mushrooms. "Gardens are beautiful circular systems that humanity has been using for thousands of years," the architect told Dezeen. "So we asked ourselves, could we create a piece of architecture that grows like a plant, or like a mushroom?" The reference to Antoni Gaudí, and also Swiss engineer Heinz Isler, is the use of inverted catenaries, which are the curves formed when a rope hangs freely between two points. As Ratti explained, this method enables architects to create structures that rely on compression rather than tension to hold their shape, by taking the form of suspended catenaries, and turning them upside-down. "We did a few structural tests and found that, while mycelium is not too strong in traction, it is strong in compression," said the architect. "We knew if we used catenaries then we could calculate how the structures would behave." While many pavilions designed for temporary exhibitions and fairs like Milan design week end up generating large amounts of waste, Ratti's Circular Garden installation will be disposed of in a fully sustainable manner. The mycelium will be shredded and returned to the soil where it will become compost, as will the ropes made from hemp. Any small metal elements used in the construction will be recycled. "For us, this is more like a lesson about how we can create architecture where every single thing can be reused," said Ratti. "It's probably the first installation ever at Salone where not one single element will be going to landfill," he added. "Everything will either go back into the soil, or will be reused." French architect Arthur Mamou-Mani is also promoting sustainable design at this year's Milan design week. His Conifera installation created for fashion brand COS consists of 700 lattice-structured bricks that have been 3D-printed from a mixture of bioplastic and wood. Photography is by Marco Beck Peccoz.